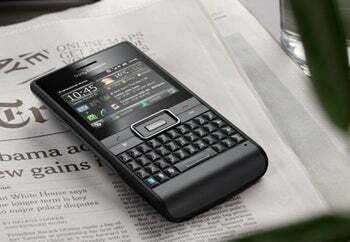 Sony Ericsson unveiled its latest business smartphone, the Aspen, which runs the newest version of Microsoft Windows Mobile, 6.5.3. Coming in advance of the Mobile World Congress in Barcelona, Aspen sports a full QWERTY keyboard and claims some green credentials. Coming as an alternative BlackBerry devices or the Nokia E72, the Sony Ericsson Aspen features just above average specs, including a 2.4-inch TFT touchscreen (240×320 pixels), A-GPS, Bluetooth (A2DP), WiFi and a microSD card slot (with 4GB card included). The back of the Aspen is studded with a 3.2 megapixel camera (no flash). The most exciting element of the Sony Ericsson Aspen is the operating system it runs on, making it one of the early few devices running the Microsoft Windows Mobile 6.5.3. The new version of the OS brings the 'Start' menu to the bottom of the screen along with the icons, an improved address book and a streamlined Internet Explorer Web browser. The Sony Ericsson Aspen also claims some green credentials, making it part of the company's GreenHeart portfolio, which means the phone is painted with waterborne paint, comes in reduced packaging and an e-manual instead of a paper one. The Aspen also comes with an eco-friendly mini charger, which Sony Ericsson says it has a low stand-by power loss and consumes less power. But bypassing all the nuanced advertising features, the Aspen is more of a delight for Windows Mobile fans. Version 6.5.3 is just another incremental dot-point release along the way to Windows Mobile 7, and despite the finger-friendliness of the new OS version, the Aspen still comes with a stylus on the back. However, the good news is that the Sony Ericsson Aspen is headed to the U.S. shores later this year, sometime in the second quarter, with 3G support for HSPA 900/2100 or 850/900/2100. The only thing that Sony Ericsson left out of the announcement so far is the price for the Aspen, which we will probably hear more of closer to the launch date. The Sony Ericsson Aspen will come in two colours, black and white. Full specs list.